Likes: Hard Rock music, night, flowers, playing instruments, feeling warm, spicy and sweet food, security, tranquility. Dislikes: Loud and complicated persons, perverts, cold, being rushed, being yelled, big risks. Lullaby is the daughter of a villain dad and a civilian mother. She was born in Fukuoka and had a happy childhood, never seeing her dad's actions as something wrong. 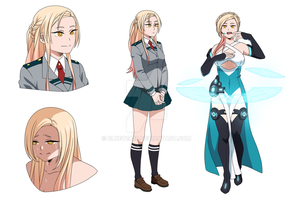 With the help of her father, entered fraudulently and easily into a low-ranking High School for heroics, in order to acquire knowledge and a specialized costume for her quirk. After leaving, she never exercised as a hero. Lullaby's father is currently behind bars, (he was defeated by All Might in the past). Her father was not only his only company; he was also her main mentor. Her mother, in the other side, ran away while she was in High School, her father convinced her that she left because they were not rich. However she did, because she discovered her husband was a villain. Lullaby after studying with other heroes, realized that many of them are people full of ego and a very few are real heroes. She believes that most part of the society is anesthetized to the pain of others. In this respect, she sees robbery as a way of waking people up. She also became a thief because she wants to have enough money to give and have so her mother comes back. "Today, the problems of others are not one's problems." "The less fortunate are the ones who share the most"
"No matter how bright the jewels are, if the bearer has no value, they have no value"
She had an opportunity to be a famous singer and abandon her life as a thief, but she thinks that would mean a betrayal to her dad. Even though, her quirk doesn't work on him he still fells asleep. Most of the time she steals in the night. Most of the songs that she sings are composed by her, others are lullabies that her mother sang to her. Great minds think alike huh? I have an OC who has the exact same power with similar drawbacks. She was even a pop star XD. The only differences is that her quirk is called "Lullaby" and her hero name is Chickadee (I wanted to give her a bird theme, since birds sing). but ye~ I love that mine is a villain~! Either way, I felt really clever when I thought her up. My main OC's quirk is pretty much exactly like this, except I named her's Siren Song. she's gorgeous, i'm in love with her!! 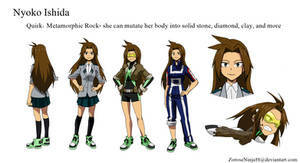 She´s a really interesting character! I had a ton of fun reading this character's bio and taking in her overall design. The costume making her look like a popstar, but every single bit of clothing reflects a musical instrument/aspect of music is beyond brilliant. Really did love how her Quirk doesn't work if the person doesn't like the music. That seems like such a BnHA drawback, I love it! "The less fortunate are the ones who share the most" - Holy crap, there is some great thought put into this character. I really like what I see on terms of her story, she really seems like a person not necessarily "evil" but just sees events in a different moral light. It seems very realistic, especially for a villain in this universe. And I really do feel for her having a goal that ultimately will change nothing if she achieves it (since her mother left for different reasons). This character is really cool! I am hoping to see more of her!